Novembers Runner of the Month may be a little familiar to many of you as she has guest blogged for us previously, has modelled our kit and appeared in our Too Fat to Run promo video earlier this year. She is a superstar in my eyes, for many many reasons, and this month there was nobody else more worthy of being recognised for her achievements. Henna Warner is a 39 year old mum of two from Kent, but I prefer to think of her as wonder woman. What she has achieved over the last year or so with her running is incredible. 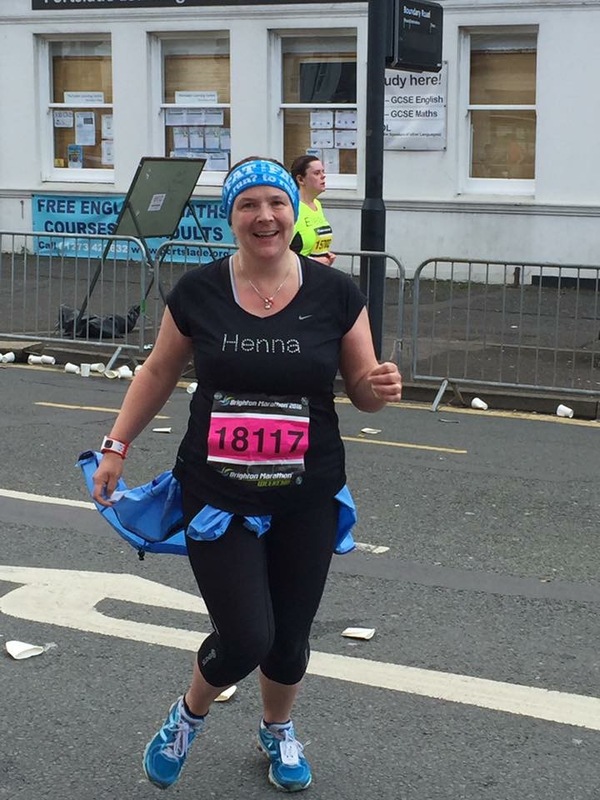 I first started running when a friend sadly died of breast cancer, and I wanted to take part in a Race for Life in her memory. I tried to follow a Couch to 5k plan and just about made it through. However, I didn’t keep it up after the race, thinking that running really wasn’t for people like me. A few years later, I found the Fat Girls Guide to Running when browsing online. I was intrigued; here was a community of people like me! I joined the Clubhouse and I have not looked back since. Do you think running has helped you in other areas of your life? I love the community! I have met many lovely people, and runners are, on the whole, a really friendly bunch. I also love the way running can fit easily into my life – I can always squeeze a half hour run into my day. At the moment I’m on a running streak so I’m running every day. (I think she is on day 60) More usually, I run three or four days a week. I try to run about 20km per week, but it varies depending on the event I’m training for. At peak marathon training, it was sometimes as much as 40km per week. Yes! At Shorne Woods parkrun. As a family, we also help at Gravesend junior parkrun on Sundays. We know you recently took part in Beachy Head Marathon, could you tell us about your experiences with training, motivation etc. 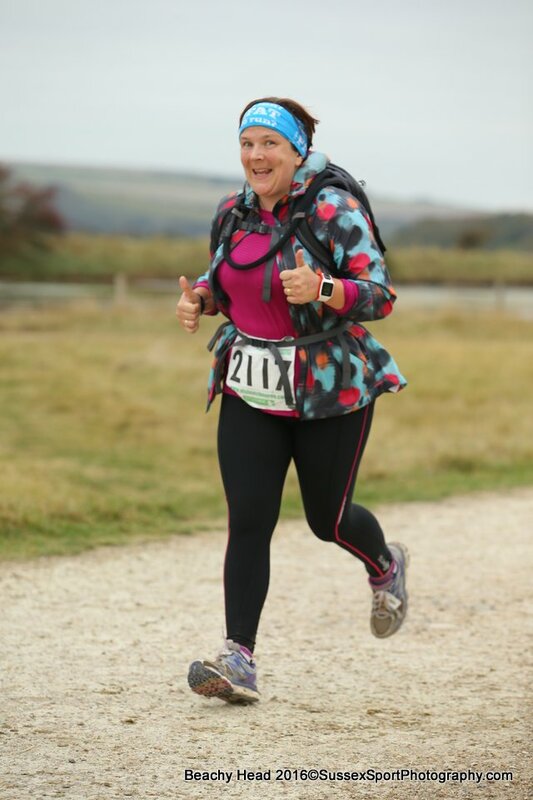 I entered Beachy Head just days after completing my first ever marathon (Brighton, April 2016). 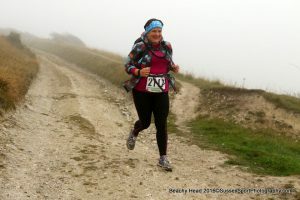 Beachy Head is a gruelling marathon, one of the toughest in the UK, due to the hugely hilly course. It has about the same amount of climb as Ben Nevis. I decided to do it because I hate hills, as I figured it was the most extreme form of exposure therapy. Luckily I live in a hilly area so I had lots of places to train in. Unfortunately getting to the start line wasn’t straightforward. I suffered a serious bout of depression that meant that I was signed off work, and put on new medication, just a few weeks ahead of Beachy Head. I was really struggling with day-to-day life, and I was worried about even attempting such a race whilst feeling like that. However I knew that the only time I felt at peace was when out running, so I decided to give it a bash. I’m so pleased that I did – it took a long 6 hours and 40 minutes to complete, but it was a lovely experience. I have been heckled, usually by blokes driving past. The standard heckle is always about my size. 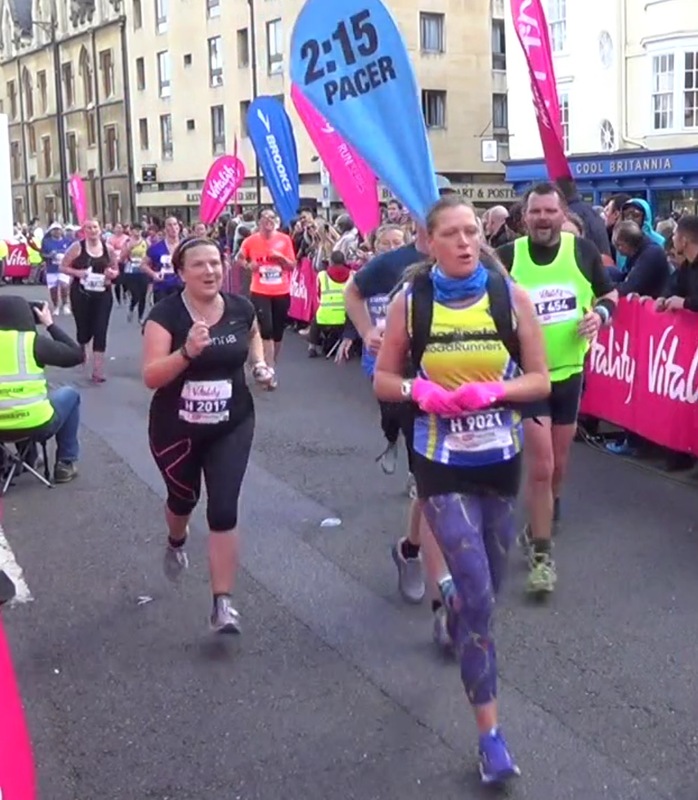 When I first started it really upset me – now I just tend to reply using international sign language and run on 😉What are your biggest fears or concerns about being a plus sized runner? I don’t look like “a runner”, and people are often surprised to find out that I can actually cover a marathon distance. The running community itself is really accepting and friendly, but people who don’t run can be judgemental. Often the assumption is that I’m running just to lose weight, and it’s frustrating to have to explain that I’m happy being this size, and that I’m running because I love it. What’s more important to you and why? Frequency or distance in running? Both are important, but at the moment, it’s frequency. I am running every day, and it’s keeping me going. Once I’m through this rough depression patch, I’ll concentrate more on distance. It’d be great to have plus size women represented more in promotional material, so that clubs and events feel more accessible to us. Promoting inclusive, body-positive sports activities for teenage girls should be a cornerstone of any policy, so that participation will become more “normal” for the next generation. But this is a tricky question, and not one that has a straightforward answer. Do you think running is just as good for your mental health as your physical? I think running is hugely beneficial to mental health. Running clears your head, calms, and gives you crucial “me-time”. When your head is all over the place, concentrating on just putting one foot in front of the other, or on just counting your breaths, is incredibly soothing. Running also helps me sleep better, I think the physical exertion is sometimes necessary to help the body and mind to rest. Just give it a go. Start small and build up slowly, join a group or parkrun if you can, and keep talking to other runners, either online or in real life. As soon as you go for a run, you are a runner, and you belong. I was rubbish at PE at school, and grew up thinking that sport wasn’t for me – that it was just something other people did. Now, I realise that sport is for everyone, there aren’t special qualifications needed to be a part of it. That I’m capable of so much more than I ever thought possible. If you had told me five years ago that I will one day run marathons for fun, I would never have believed it. The Clubhouse is like my second family. Without it, I wouldn’t be running AT ALL. I have met some truly amazing people through the Clubhouse, and have dared to do the impossible with the warm encouragement of the members. 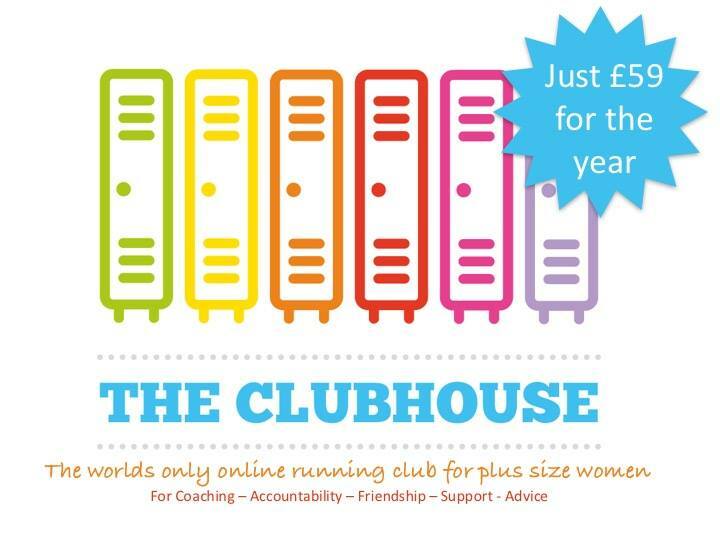 The Clubhouse rocks. Henna is such an inspiration to us all, me especially!! !